Rest Easy. Expert Coverage. Worldwide. 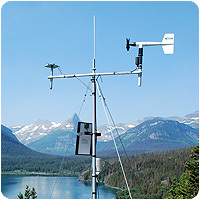 Does your organization have weather stations installed at your facility or at many locations around the country or world? If so, you no longer need an IT expert in-house to manage your weather station’s data. Whether you have a one or more than 100 weather stations in the field, we will help organize, manage the data flow, archiving, on-line display and delivery of all of your active weather stations worldwide! We already manage data for more than 18,000 sites across the world; why not trust the experts with your own network’s data 24/7? Once we are collecting and archiving your network’s data, you can seamlessly pull the data at any time in any format for efficient use within your organization. Even better, add other data to your feeds such as severe weather alerts, hourly or 5-day forecasts and even live radar maps and satellite imagery. Leave all of the details of managing your weather network data to our expert customer service team and proven technology. During the loading of your network’s weather data to the AnythingWeather data center, we introduce quality control measures to make sure all your network’s stations are reporting accurate and reliable data. When issues are revealed through the quality assessment system, alerts are produced to inform your team about a potential issue. This saves your team time and money, and helps fix issues more quickly and efficiently. You will enjoy having a dedicated Account Manager to monitor your network on a daily basis and to report any inconsistencies or problems with the network. Your Account Manager will also be your go-to person for setting up new stations, questions, concerns, or for anything else weather-related. We are like having your own on-staff weather experts. As part of our Data Management Solution, all of your weather data feeds will be closely managed and monitored by our QC department and can be delivered directly to your company website and/or at AnythingWeather.com. AnythingWeather can also customize a private and secure webpage, where all of your data will be displayed and available worldwide in whatever format and display you want. Our dedicated staff is here to help support your business and to ensure that if there are any questions or problems, we will be ready to assist you, whenever you need assistance. When you partner with AnythingWeather, we dedicate ourselves to providing exceptional customer service and support, 100% guaranteed. Our experts and account managers will work with you to seamlessly manage the data from your weather station or network, without the need for in-house IT. Contact us to learn more.